Wednesday was the most gorgeous day I have seen in a long time. It was warm, but not too warm, and breezy, with expansive blue skies dotted by white puffy clouds, like little sky sheep. 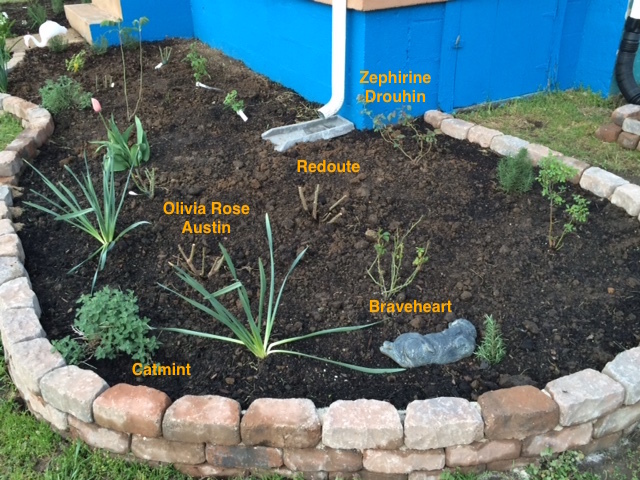 Thursday called for rain, so I thought Wednesday would be the perfect day to plant my own-root roses. After lunch, I changed into my “gardening” clothes and headed outside. There were tons of birds chirping and singing. My neighbor across the street was out working in his yard as well. My daughter came out to to replace the inner tube on her bike tire, and then road test her repair. Since this week is spring break, I could hear kids laughing and playing on the next block. I love our neighborhood! The houses are small, so when the weather is nice, people spill out of their homes on to their porches or into their yards. You can wave across the fence, or chat on the sidewalk. I wouldn’t want to live anywhere else! The first thing I did was mow the yard. Usually, Steve mows, but we got a nifty, lightweight mower a couple of years ago, so I decided to try my hand. There is not really any grass in our yard yet, just a lot of winter weeds. While I was mowing, our neighbor walked by, and he stopped to chat for a few minutes about the beautiful day. I was able to get the side yard and most of the front yard mowed before the battery died. 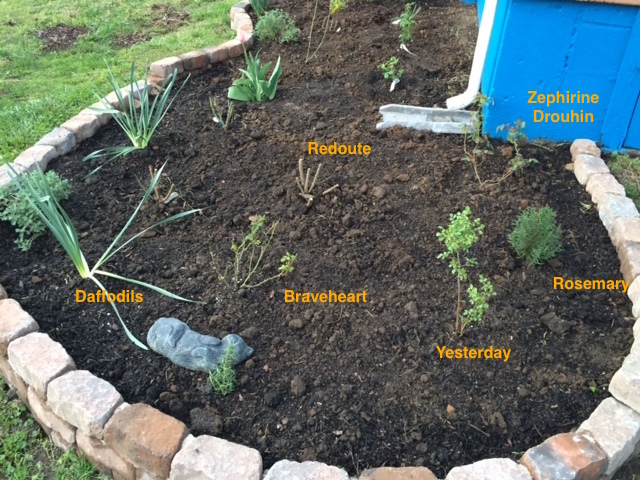 While it recharged, I planted my roses. I brought all the pots around from the back porch, and set them in the bed where I wanted to plant them. Then, I started digging. I dug one hole at a time. Once the hole was the right depth, I used my cultivator to break up the clumps of native soil and mix in plenty of garden soil and composted manure, which I had spread in the beds a couple of weekends ago. I also used the cultivator on the soil that I had removed from the hole, tilling it until it was finely textured and well mixed. I carefully removed the rose from its pot, set it level in the hole, then backfilled with the tilled soil. 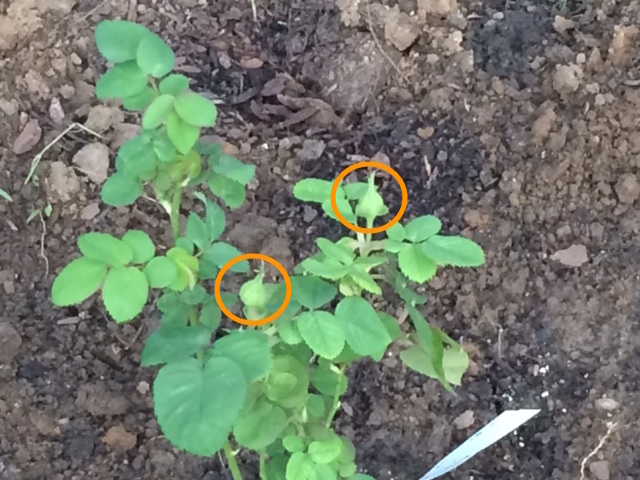 I lightly patted the soil, then used my hands to construct a small berm around the plant. Then, I placed the garden hose by the plant, with the water set to “just a trickle”. I left the hose to run while I planted the next rose. I also divided and distributed the clump of daffodils that was in the bed. I divided the catmint and placed the two clumps in separate areas along the edge of the bed. 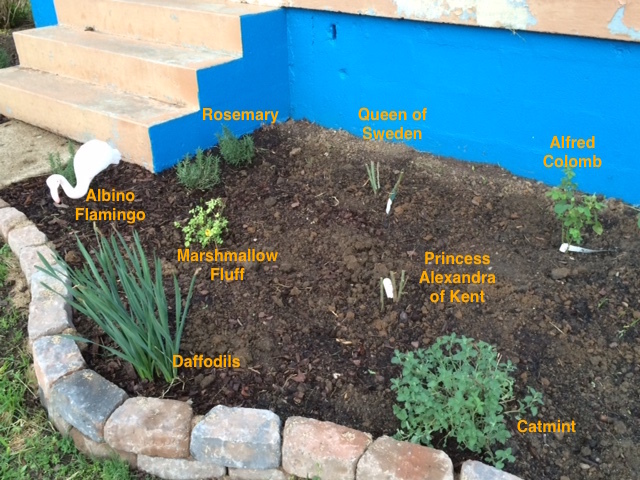 (I will be ordering more catmint next month to fill out the border of the bed.) 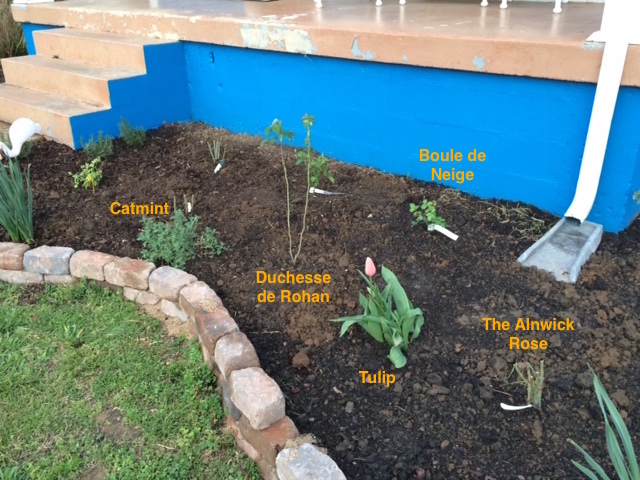 I also relocated a lone clump of tulips, which was unfortunately in the exact spot where I planned to plant one of my roses. After several hours of work, everything was planted, or relocated, and watered, so I finished mowing the yard. Unfortunately, it was too dark by the time I was done to get pictures, so these pictures are actually from rainy Thursday. Notice the storm clouds off to the north. 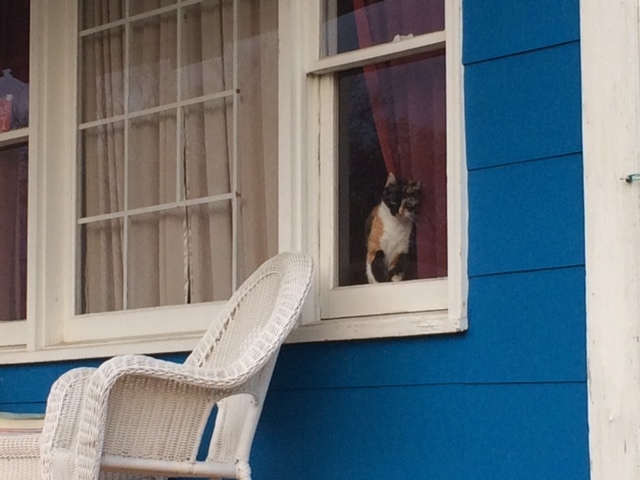 Notice the little face in the front window above the right-hand chair on the porch. Who is that? It’s Bridget! She’s so cute! Back when I ordered my roses, some of the roses that I had decided on were unavailable (Felicite Parmentier, Maid Marion). Rather than Maid Marion, I chose the Bourbon Duchesse de Rohan. Additionally, I got a free rose called Yesterday from Rogue Valley Roses. 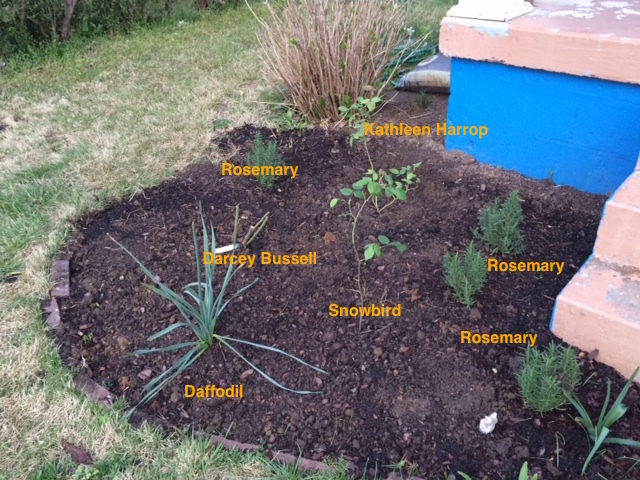 I reworked my planting plan to accommodate these new roses, and here are the results. Only a few things remain to complete my rose garden for the year. I need to finish the wall/edger on the left bed. 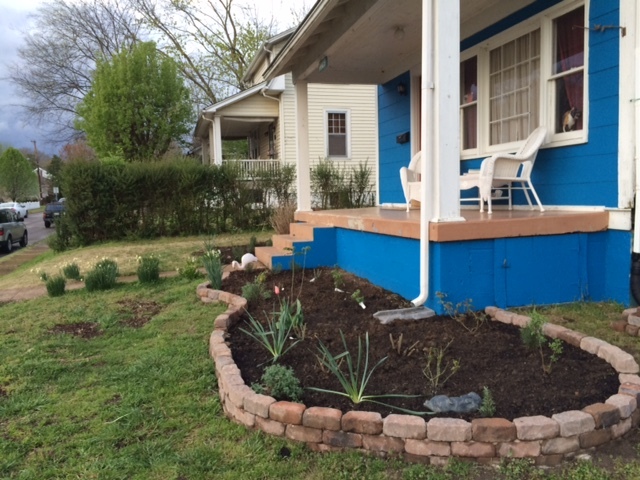 Next month, I will be installing an irrigation system as well as the rest of the catmint. And the whole bed needs a nice layer of mulch. Later, this summer, I will probably construct a couple of trellises for Zephy 2 and her sister Kathleen Harrop to climb. Boule de Neige can also be a climber, so I will keep an her on her as well. Hopefully, I can reuse some of the wood from the trellis that Zephy 1 lived on, as well as some pieces from an old arbor we used to have in the back yard. But for now, all I need to do is let my roses get settled in their new home!